Mid-February Newsletter – More Savings! Send a friend and both of you will benefit! 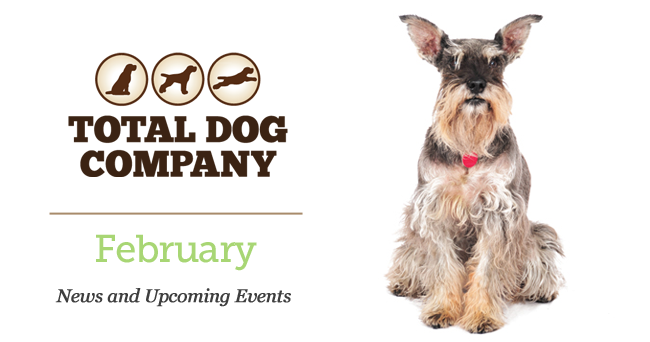 Do you have neighbors and friends who haven’t been to Total Dog Company yet? Print the coupon below (must be printed). If they are not on our customer roster, they get 15% off their first purchase. 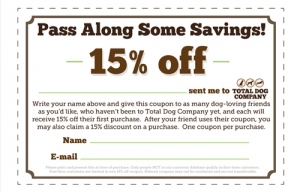 We keep the coupon with your name on it and the next time you’re in, YOU get 15% off your purchase. If more than one neighbor or friend comes in, you can use only one coupon per visit. What if you or your neighbor or friend are feeding a food that wouldn’t meet the Total Dog requirements for good quality dog food? We want better for these dogs! American Natural Premium is a good quality dog food (made by Fromm) at a reasonable price. They are offering substantial discounts if you’ll trade in your low quality dog food and try American Natural Premium. Get $3 off a 4-lb. bag or $10 off a 12-lb. or larger bag of any variety of American Natural Premium.